The Matrix T30 is the newest treadmill in the company's lineup, joining the T50 and T70 to make three non-folding choices for you. It has all of the features and capabilities of the higher end models in a more compact frame, making it a great choice for your home gym. The T30 has a sleek and modern look, with a welded frame and a well-built, durable deck. You have three different consoles to choose from, so you can customize the machine to your liking. There seems to be a lot of excitement surrounding the release of the new Matrix T30, and we can think of at least two reasons why. For starters, it's more affordable than the rest of the lineup, which is definitely a good thing. Everyone wants a high end treadmill, but it's not always in the budget. The T30 is still expensive, but it's more within reach than the other models. Second, it's more compact than the other Matrix treadmills. At 72" long it's about 5" shorter than its folding counterpart, the TF30, which means it will fit into your home gym a bit easier. It's also almost 40 lbs. lighter. 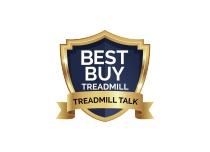 So the new T30 treadmill is a more accessible cardio machine, which means it will probably become one of the best sellers for the company. You get a 20" x 55" well-cushioned deck and speeds up to 12.5 mph which is enough to satisfy even the most serious runner. There is incline capability up to 12%, and a strong but quiet 3.0 HP Johnson Drive motor. One of the most appealing features of the T30, and all of the Matrix treadmills for that matter, is the fact that you can choose from three different console options for your machine. There's the base XR Simple console, with an 8.5" blue LCD display; an XER Intuitive console, with a 10" touch screen; and an XIR Ultimate console, with a 16" HD touch screen. Depending on which console you choose, you get different features and capabilities. All of the consoles offer ViaFit workout tracking and the patented Sprint 8 interval workout. The two touch screen upgrades add on-screen videos, Bluetooth capability, smart phone compatibility, speakers, USB port and various fitness and entertainment apps. 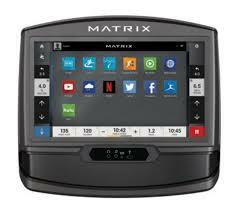 Some of the extras on the Matrix T30 treadmill include Energy Saver mode, heart rate monitoring, magazine/tablet rack and pockets for your water bottle. It comes with a very generous warranty: lifetime coverage on frame, motor and cushioning, 5 years on parts and 2 years on labor. That's about as good as it gets in the industry today. How Does the T30 Compare to the Other Matrix Treadmills? 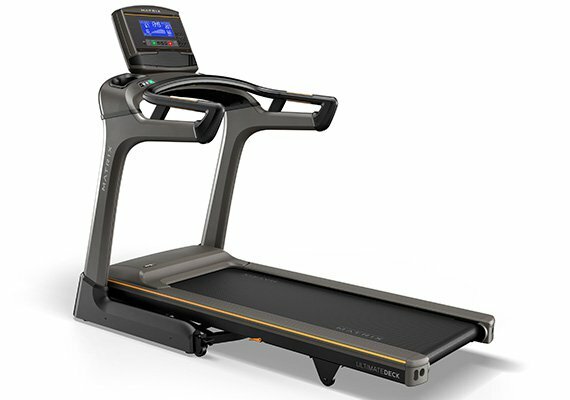 The Matrix T30 is the new entry level model, so although it is packed with great features and is built rock solid, it doesn't have some of the additions that the higher level treadmills have. As you've already learned, the T30 gives you a 20" x 55" running area, up to 12.5 mph speed, up to 12% incline, a 3.0 CHP Johnson Drive motor, the Ultimate Deck system, ViaFit workout tracking and a 300-lb max weight capacity. The TF30 is the folding version of the T30. The two machines are very similar, except the TF30 is a bit longer, with 15% incline and a stronger 3.25 HP motor. The step-up T50 treadmill gives you everything the T30 has, plus a longer 20" x 60" running deck, up to 15% incline, a 3.25 CHP motor a 400 lb max user weight. It also adds aluminum side rails and a stronger 7 year parts warranty. Just like the TF30, the TF50 is simply the folding version of the T50. A bit longer and heavier, but otherwise the two treadmills are identical. The top of the line Matrix T75, which replaced the former T70, has the largest running belt of all at 22" x 60" and the most powerful motor (a 3.0 HP AC Drive) on top of all of the features that the T50 has. So as you can see the Matrix T30 has plenty of great features and capabilities, but one of the upper level models might be more appealing to you. Which Matrix Treadmill Should You Choose? That's a very good question. Remember, you can't go wrong with any Matrix treadmill. We might love one more than another here at Treadmill Talk, but that doesn't mean you won't prefer another model. The folding TF30 has been one of our top picks for several years now, as it has just about everything you need for a great workout. Now with a non-folding model available, we may have to take a closer look. If it comes to down to budget, and you're looking closer to the $2000 level, then definitely consider the new Matrix T30. It's a few hundred dollars cheaper than the TF30, and it's more compact so you may not need the folding capability. The TF30 does give you more incline capability, so if that's your thing that might be the only hangup with the T30. Otherwise it's the right choice. If you are on the taller/larger side, you might be better served with one of the more advanced Matrix treadmills. You don't necessarily need the power of the T75, but either the T50 or the TF50 will give you more room to stretch out as well as stronger motors to handle more intense workouts. If you will be doing a lot of running, those will be better choices for you. As far as consoles, that's a personal choice. The base XR Simple console is perfectly fine and very similar to what you get on a Life Fitness or Precor treadmill, Matrix's two main competitors. If you have the budget for it, the XER and XIR touch screens are awesome and they give you much more functionality...but you have to decide if you want to spend the extra money for that added capability. The new Matrix T30 is certainly a welcome addition to the lineup, with a more space-friendly design and a lower price point. If you're looking to get a club quality treadmill for your home gym, the T30 is definitely worth considering. It compares favorably to the entry level choices from Life Fitness and Precor, and has a lot of unique features not found on those models. If you're more of a runner, or the treadmill will see very heavy use, consider upgraded to either the T50 or TF50, as those machines have larger running surfaces and stronger motors. The top of the line T75 is great too, but not really necessary for home use. Get the popular Matrix T30 on sale right now!